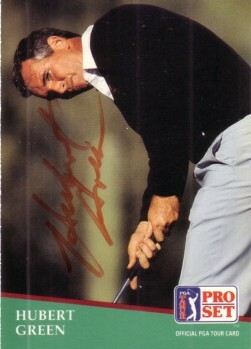 1991 Pro Set golf card autographed in orange marker by 1977 U.S. Open and 1985 PGA Championship winner Hubert Green. Obtained in person, with certificate of authenticity from AutographsForSale.com. ONLY ONE AVAILABLE FOR SALE.